Prominent & Leading Manufacturer from Sahibabad, we offer back pillow. They help align your neck, back and hips, as well as improve your posture. 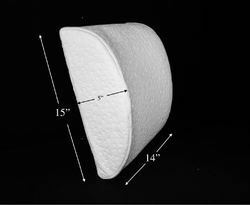 Most support pillows provide support for your lowerback, as this is area that often times needs additional support. Many cases of backpain are caused by bad posture.